His abstract sculptures – with their mixture of architecture, music, mathematics and science delicately expressed in brass, ceramics or plaster – unarguably labeled Fausto Melotti (1901-1986) as one of Italy’s most iconic and recognizable artists of the post- war period. Yet, for Italian readers who approached literature in the nineties, Melotti’s work has too-often been experienced as the “supporting act” to the written virtuosity of the great writer Italo Calvino: from the late eighties onwards, pictures of Melotti’s sculptures have appeared on the covers of almost all of Calvino’s books published in Italy, over time re-shaping the general public’s perception of such works. The reciprocal influence of the writer and the artist, dated from the seventies, is known and well-documented: their individual creative processes coincided in time, with the rigor and lightness of one coming to be mirrored by the abstraction and geometry of the other. Nonetheless, Melotti’s autonomous aesthetic contribution to Italian art has, of course, much deeper roots that his (unwitting) visual contribution to Calvino’s oeuvre. One of the many merits of the exhibition “Fausto Melotti” at Nouveau Musée National de Monaco is precisely that it disentangles the two artists, it showcases the “Melotti-before-Calvino”: a sculptor in fieri, walking the tightrope between craftsmanship and the art world but already moving freely among and between plaster, ceramics, and metals, turning them into poetic gestures and visionary meditations. Curated by Eva Fabbris and Cristiano Raimondi, the show brings together around 20 metallic sculptures and more than 70 ceramic pieces, almost all of which have been published photographically within the pages of Domus magazine between 1948 and 1968 (before the friendship with Calvino blossomed into an intellectual jam session). The result is a visual manifestation of another of Melotti’s intense artistic relationship, that with the influential architecture magazine (and with its founder, Gio Ponti), which in turn reveals a polymorphous figure: Melotti the artist, the columnist, the reviewer, the careful critic. Using the lens of Domus to examine Melotti both avoids the clichéd historical approach and lends an intriguing perspective to his multidisciplinary art. The second notable merit of the show is the way in which such “multidisciplinarity” is presented and displayed. The design of the exhibition – by Valter Scelsi and Baukuh – is elaborate, blending elegance and intensity, words and works, via the clever use of mirrors to break up the space and establish the tempo. This sense of rhythm is key, as it reflects a central theme of Melotti’s sculpture: born into a musical family, the sculptor often combined his investigations on the nature of art and architecture with the aesthetics of the score, uniting straight lines and curves with concave and convex elements to create harmonious compositions and multiple visual melodies. Writing about his creative process, the artist said: “I think that’s something similar to what happens to a composer: he goes to the piano, puts his hands on the keys, and out come the sounds, which are then organized in a pattern”. Yet, even if Melotti is known to be professionally influenced by classical music, the Monaco exhibition – with its purposeful and crafted miscellany of sculptures, photographs, ephemera, magazines and memorabilia – is a tangible reminder that, when working in his studio, the artist preferred to listen to the unpredictable flow of the radio rather than Bach. 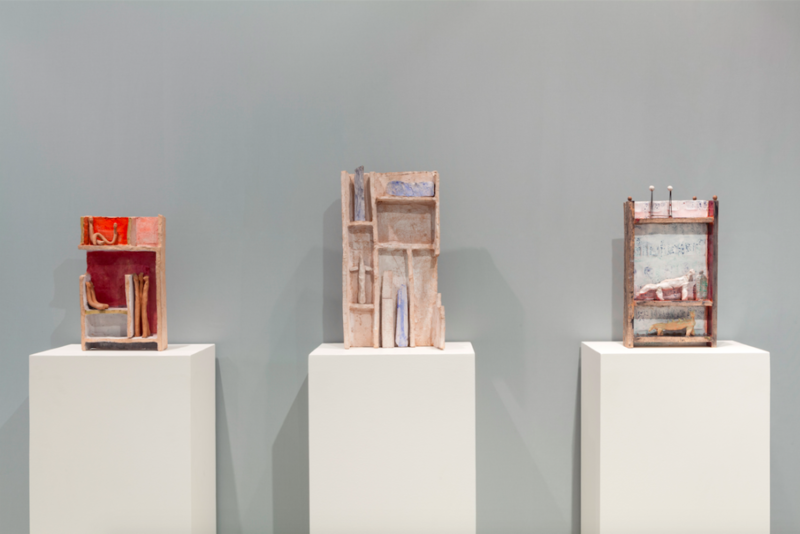 Finally, the third significant virtue of this curatorial endeavor is the side-long offering of the work of another, much younger, Italian artist: Alessandro Pessoli (1963), whose ceramics and painted majolica are presented in the Project Room on the third floor of Villa Paloma (until September 29th). Pessoli and Melotti not only share an uncommon dexterity for free movement between different materials, but also a peculiar nimbleness of thought, which is enhanced by their colorful imagination, allowing them to flow smoothly through themes, motifs and genres. Yet, seen within the halls of Villa Paloma, not so distant from one another, the respective pieces illustrate another appealing parallel: the amalgamation of the disparate strains of Italian art. Between them, Pessoli and Melotti tackle the iconography of Florentine Renaissance, the Futurists’ embrace of modernity, the metaphysical cravings of the Surrealists and the material curiosity of traditional craftsmanship. This taste for diversity is probably best expressed in an article entitled L’Incertezza (uncertainty) that Melotti published on Domus in 1963. With words that to a contemporary ear sound simultaneously naïve and cathartic, the artist complains that to satisfy the needs of the market “it is necessary, it is demanded, that all the works of an artist be rigidly labeled”. “But speaking of our uncertainty,” he adds, “we don’t think of the sublime, almost theological indecision of the great spirits.” Melotti then ends his protest with a set of poetic words that might have been written unknowingly for the purpose of describing precisely the continuum between his own aesthetic practice and Pessoli’s: “For all one knows, the horse that goes hopping mad and kicks against the fence may be just dreaming of nothingness”.